Methods: Between 2006 and 2017, 192 patients underwent RP (open RP [ORP], laparoscopic RP [LRP], and robotic RP [RRP]) at our center, of which 109 had D'Amico HR disease. Preoperative, postoperative, and pathological outcome data were analyzed for patients with HR disease as per the D'Amico classification. Subgroups were formed to determine whether an increasing number of risk factors (1, 2, or 3) were associated with poorer oncological results and early BCR. The Kaplan–Meier method with log-rank test was used to test the difference in BRFS between the groups. Univariate and multivariate analyses were done to find significant variable against BCR. Results: According to the D'Amico criteria, 109 patients had HR, 63 patients had intermediate-risk, and 19 patients had low-risk disease. These 109 patients with HR disease were analyzed in our study (50 RRP, 33 ORP, and 26 LRP). A total of 59 (54.1%) patients had one HR factor (1HR), 44 (40%) had two HR factors (2HR), and 6 (5.5%) had three HR factors (3HR). The mean follow-up for our patient population was 21.5 ± 19 months (median 18 months; range, 0–108). Overall, the 2-year and 5-year BRFS was 45% and 35%, respectively (mean BRFS 46 ± 6 months). Two-year BRFS was 63%, 23%, and 22%, respectively, for 1HR, 2HR, and 3HR (logrank, P < 0.0001). The prognostic substratification based on the three risk factors was significantly predictive for adverse pathologic features and oncologic outcomes. Conclusion: Substratification based on the three well-defined criteria leads to a better identification of the more aggressive cancers and prediction of need for additional treatment modalities. Localized HRCaP includes a heterogeneous population of patients with variable oncological outcomes. There is a relative lack of data regarding the pathological features of CaP in the Indian population; also, the long-term oncological outcome of those undergoing surgery has not been studied well. Widespread screening has resulted in stage migration in Western countries; the same is perhaps not true for the Indian population. According to the D'Amico's classification, a patient with PSA >20 ng/mL and/or preoperative Gleason score (GS) of 8–10 and/or clinical disease ≥T2c can be considered to be at high-risk (HR) of progression despite radical treatment with a curative intent. Even though several treatment options, including radical prostatectomy (RP), radiation therapy (RT), and androgen deprivation therapy (ADT) alone or in combination are available, the recurrence rate remains high regardless of the type of treatment. Long-term follow-up studies of HRCaP patients treated with multimodality treatment including RP with or without adjuvant RT ± ADT have revealed good oncologic outcomes. In the present study, we report a detailed analysis of the pathological outcomes and long-term biochemical recurrence (BCR) of HRCaP undergoing RP at our center. Further, we aim to define subgroups by combining 1, 2, or 3 criteria of tumor aggressiveness (cT2c-T3b, PSA >20 ng/ml, and GS >7) among surgically treated patients of HRCaP and determine if increasing number of risk factors correlated with poorer biochemical recurrence-free survival (BRFS). Inpatient and outpatient case records of consecutive patients who underwent RP (open [ORP], laparoscopic [LRP], and robot assisted [RRP]) from 2006 to 2017 at our institute were reviewed. Preoperative clinical parameters analyzed were patient's age, serum PSA, clinical T stage (cT), and transrectal ultrasound (TRUS)-guided biopsy GS. TRUS, magnetic resonance imaging abdomen, and whole-body skeletal scan/prostate-specific membrane antigen positron emission tomography scan were done as part of staging workup. ORP, LRP, or RRP was done after approval from the institutional multidisciplinary tumor board. Lymph node (LN) dissection was not done in the initial cases of LRP and ORP. For those in whom pelvic LN dissection was performed (n = 88), extended LN dissection was done, which involved removal of the internal iliac chain in addition to the external iliac and obturator packets. The patients were classified into three risk groups according to the D'Amico criteria, and those stratified as HR (PSA >20 ng/ml, clinical T2c or more stage, and biopsy Gleason sum 8–10) were analyzed in this study. Two uropathologists evaluated the grade of malignancy in the biopsy and prostatectomy specimens according to the 2005 International Society of Urological Pathology Consensus Conference on the Gleason grading system and determined the pathological stage based on the 2009 tumor–node–metastasis classification. The RP specimen was coated with India ink to delineate the surgical margins and then fixed in 10% formalin. After fixation, the apex and bladder neck were removed and cut into sagittal or radial sections. The remainder of the specimen was cut into transverse, 3–4 mm sections, perpendicular to the long axis of the urethra. The resultant tissue slices were embedded and processed as whole mounts. The specimen was examined for the following variables: Gleason grade and sum, pathologic stage, seminal vesicle (SV) invasion, extraprostatic extension, and margin positivity. A positive surgical margin (PSM) was defined as the presence of cancer at the inked margin of resection in the RP specimen. The bladder neck margin was coned from the RP specimen. Bladder neck involvement was defined as the presence of neoplastic cells within thick, smooth muscle bundles of the coned bladder neck in the absence of intermixed benign prostatic glandular tissue on the corresponding slide. All surgical complications were classified using Clavien–Dindo classification. Postoperatively, PSA was monitored at 1 and 3 months, 3 monthly till 2 years, and 6 monthly thereafter. BCR was defined as a PSA of 0.2 ng/ml or need for additional therapy (salvage) due to failure to achieve nadir PSA <0.2 ng/ml after RP. Patients with multiple adverse factors (>2) on final histopathology such as nonfocal margin positivity, SV invasion, extracapsular extension (ECE), GS ≥8, or preoperative PSA >20 ng/ml were candidate for adjuvant therapy (RT) following RP before the serum PSA exceeded 0.2 ng/ml. In these patients, the time point of adjuvant therapy was defined as the date of disease recurrence. Patients with a single adverse histopathological factor who achieved nadir PSA <0.2 ng/ml following RP were offered salvage RT when PSA reached 0.2 ng/ml on follow-up. Adjuvant or salvage treatment was further individualized for all patients, considering their age, comorbidities, and performance status; the multidisciplinary tumor board approved the treatment plan. Patients with BCR were analyzed to identify the factors affecting recurrence with univariate analysis. Since the risk classification of D'Amico is composed of three factors, analysis and BCR correlation according to the number of HR factors was also done. Other factors studied to identify risk factors for BCR were age, PSA, TRUS biopsy GS, and clinical risk group as per the D'Amico risk stratification and histopathological features. The histopathological variables were ECE, SV involvement, pathological T stage (pT), pathological nodal stage (pN), PSM, and final GS of the surgical specimen. Continence status was determined on follow-up, depending on the pad usage by the patients. Patients using no pad or safety liner were considered to be continent whereas those requiring one or more pads each day were considered incontinent. Patients with occasional incontinence not requiring any safety liners were labeled as having mild stress incontinence. The collected data were compiled using Microsoft Excel 2010 and analyzed using the Statistical software SPSS 20.0 version (SPSS for Windows, version 20.0; Chicago, IL, USA). Continuous variables were expressed as mean ± standard deviation, while categorical variables were expressed as frequency and proportions. Chi-square test was used to determine the association between categorical variables. The independent student's t-test was used to compare continuous variables. 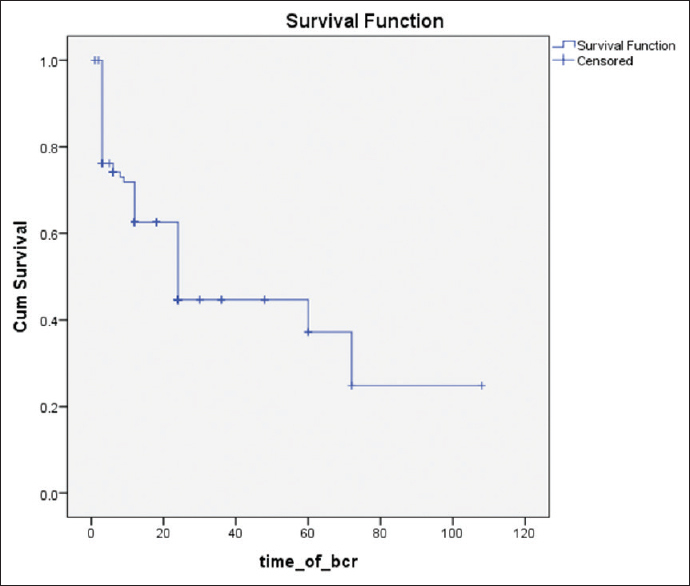 Two--year and 5-year BCRFS was estimated using Kaplan–Meier method (survival analysis). The Kaplan–Meier method with logrank test was used to test the statistically significant difference in BCRFS between the groups. Univariate analysis was done to find the significant variable against BCR. For multivariate analysis, binary logistic regression was used to find significant variables for BCR. A P value of < 0.05 was considered statistically significant. Between March 2006 and October 2017, 192 patients underwent RP at our institute, including ORP, LRP, and RRP. Case records of these 192 patients were reviewed. On stratification as per the D'Amico risk group, 109 patients had HR, 63 patients had intermediate risk, and 19 patients had low-risk disease. One patient had organ-confined leiomyosarcoma of the prostate. The 109 patients with the D'Amico HR disease were analyzed in our study (50 RRP, 33 ORP, and 26 LRP). Patient's descriptive characteristics stratified as per the number of risk factors are shown in [Table 1]. A total number of 59 (54.1%) patients had one HR factor (1HR), 44 (40%) had two HR factors (2HR), and 6 (5.5%) had three HR factors (3HR). The distribution of risk factors is shown in [Figure 1]. Overall mean serum PSA for the population was 19.66 ± 15.1. Patients with more risk factors had significantly higher PSA compared to those with one risk factor (P = 0.0001). Majority of patients had cT stage of T2 (48.6%) and T3 (46.8%) at the time of presentation. 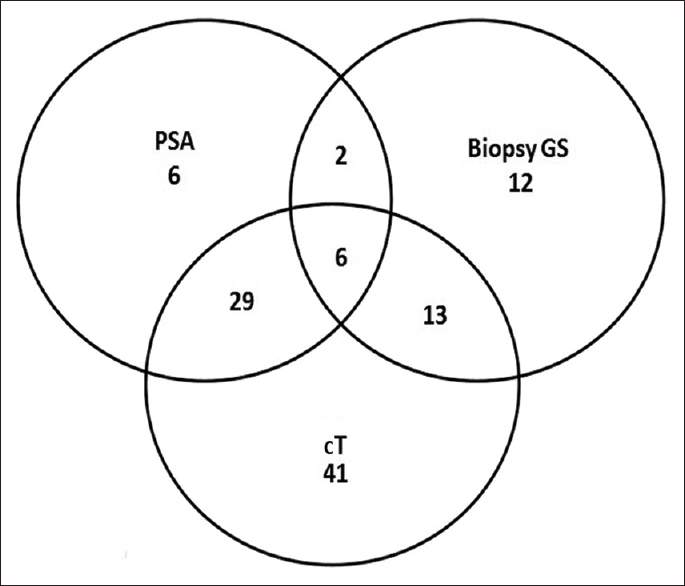 Most patients in 3HR group had biopsy and specimen Gleason sum >7 with a significant difference in distribution between the risk groups (P = 0.0001 and P = 0.023, respectively). In the overall patient population, 45% cases were pathological T2 (pT2), 53% were pT3, and 2% were T4. 83% and 75% in 3HR and 2HR group, respectively, were pT3 (P = 0.0001). PSMs were reported in 50.5% (55) of cases and increased within the risk substratification, i.e., 33.9%, 68.2%, and 83.3% for 1HR, 2HR, and 3HR, respectively (P < 0.001). The mean LN yield was 15 ± 8.6 (n = 88). There was no significant difference in the LN yield in the different surgical approaches, that is, ORP (13.3 ± 8.6), LRP (13.5 ± 8.5), and RRP (16 ± 8.5) (P = 0.334). Of the 22 patients who had lymph nodal involvement, 21 were in 2HR and 3HR group (P = 0.0001) [Table 1]. Postoperative complications were seen in 11 (10.09%) patients [Table 2]. Rectal perforation requiring diversion colostomy (n = 2), obstructed inguinal hernia with peritoneal abscess (n = 1), lymphocele requiring drainage (n = 3), and postoperative sepsis (n = 1) were the major complications. There was no mortality in the perioperative period. Two patients in our cohort were lost to follow-up. The mean follow-up for our patient population was 21.5 ± 19 months (median 18 months, range 0–108). There were three mortalities in the follow-up period, two of which were CaP-specific mortality. Overall, the 2-year and 5-year BRFS was 45% and 35%, respectively (mean BCRFS 46 ± 6 months) [Figure 2]. The prognostic substratification based on three risk factors was significantly predictive for adverse pathologic features and oncologic outcomes. Two-year BCRFS was 63%, 23%, and 22%, respectively, for 1HR, 2HR, and 3HR (logrank P < 0.0001) [Figure 3]. Mean BCRFS was 63 ± 8.5, 14.7 ± 2.1, and 9.4 ± 3.6 months, respectively, for 1HR, 2HR, and 3HR. Additional treatment in the form of adjuvant and salvage therapy was given to 37 (33.94%) patients. Adjuvant therapy (ADT and RT) was required in 9 (8.2%) patients while salvage treatment in the form of RT, ADT, or combination of both was given in 28 (25.68%) patients [Table 3]. Serum PSA at diagnosis, final GS, PSM, SV invasion, ECE, pathological tumor stage, LN positivity, and number of HR factors were significantly associated with BCR on univariate analysis [Table 4]. LN density ≥15% was significantly associated with BCR at 2- and 5-year follow-up. On multivariable analysis, serum PSA at diagnosis, pT stage, pN status, and GS on specimen histopathology were independent predictors of BCR [Table 5]. 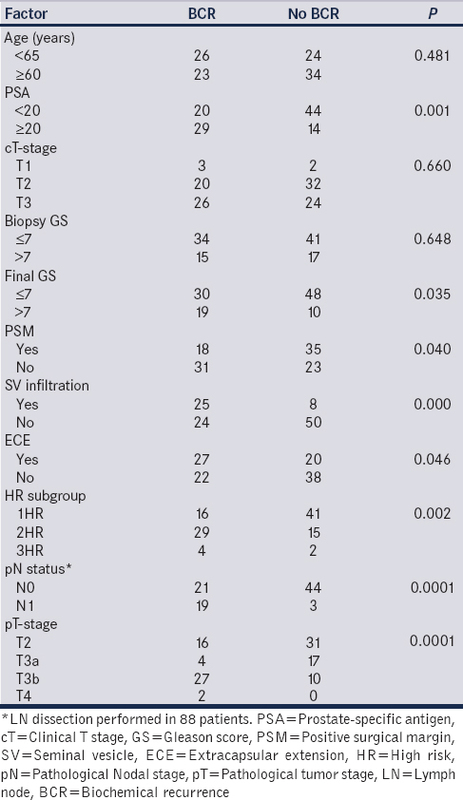 Subgroup analysis as per the surgical approach showed no significant difference in the PSM rate (P = 0.480), continence rate (P = 0.299), or BCR (P = 0.867) in the three surgical approaches (ORP, LRP, and RRP) [Table 6]. 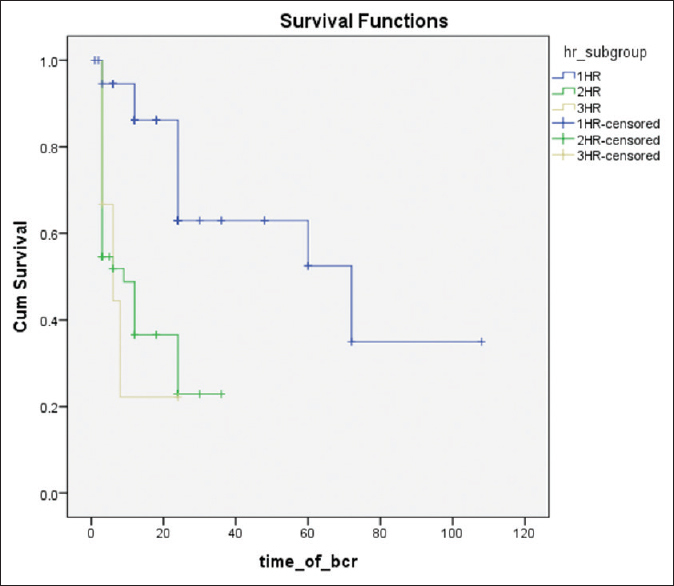 The current study presents the oncological and pathological outcomes of RP for organ-confined HR CaP in the Indian population. Approximately 56.7% (109) of all patients undergoing RP at our center were HR prostate cancer cases/HRCaP. The CaPSURE database has noticed a decrease in men with HR disease from 41% to 29% (1989–2002) and HR disease represents approximately 24% of patients in recent studies. However, studies from India and Japan CaP database show a high incidence of HR disease in the Asian population., This can be attributed to the lack of PSA screening in India. In our study, 45.5% (50) of patients had more than one HR factor which is higher as compared to reports from other centers. Gupta et al. and Beauval et al. reported 27.7% and 20.5% patients with more than one HR factor, respectively, in their series of HRCaP., Cooperberg et al. reported 23.5% of patients with more than one HR factor in CaPSURE database. This can be attributed to the heterogeneity in the epidemiology of CaP between the Western and the Indian population. In our cohort of HRCaP, cT was the single most common risk factor contributing to HR stratification of patients (38%) while PSA alone was the least common risk factor. Most other series show Gleason grade as the most common HR factor ranging from 29.7% to 74.1%.,, Gupta et al. concluded that PSA was the common factor for HR stratification (55.6%) while Gleason grade (33.3%) was the least common. This disparity can be due to a higher number of patients with two-risk factors in our study [Figure 1]. There is no definitive consensus on the definition of HRCaP, and not all patients classified as having HRCaP by common definitions have a uniformly poor prognosis after RP.,,, Yossepowitch et al. compared eight different definitions of HRCaP to classify 4708 men treated with RP. Depending on the definition used, the 5-year BCRFS ranged from 49% to 80%. In the present study, we demonstrated the difference in outcomes of HRCaP according to the number of preoperative risk factors, with increasing number of risk factors correlating with poorer BCRFS. The patient subgroup characterized by a single HR factor is benefited the most from surgery because of favorable cancer control and this subgroup has a longer BCRFS. There was no difference in BCR in 1HR group depending on the type of risk factor present (PSA, cT, or biopsy Gleason) (P = 0.328). Spahn et al. evaluated the relationship between the number of HR factors and outcome after RP in 712 men with a PSA >20 ng/ml. Men with PSA >20 ng/ml as a single risk factor had more favorable clinical progression-free survival, CaP-specific survival, and overall survival than men with a PSA >20 ng/ml and stage cT3-4 or with all three HR factors. Another study in 4760 men with HRCaP treated with RP also showed that men with one HR factor (PSA >20 ng/ml, GS 8–10, or clinical stage T3-4) had a better BRFS than men with two or more HR factors. Beauval et al. in their study of 523 HRCaP showed BRFS of 56.4%, 27.06%, and 18.46% for 1HR, 2HR, and 3HR (P < 0.0001). Our study corroborates these results. The overall 2-year and 5-year BCRFS for our patient cohort was 45% and 35%, respectively. Abdollah et al. in a multiinstitutional study of 1100 patients with HRCaP had 5-year BCRFS of 49% and 26%, respectively, in HR and very HR category. Other centers from India report BCR of 26%–28% at 12 months., This relatively high BCRFS from Indian centers can be attributed to less number of patients with multiple HR factors. Overall PSM rate in our study was 50% and margin positivity increased with increasing number of risk factors (68% and 83% in 2HR and 3HR, respectively). On stratification as per surgical approach, PSM rate was 42%, 50%, and 56% in ORP, LRP, and RRP, respectively (P = 0.48). Beauval et al. reported margin positivity rate of 44% with similar trend among the three risk groups. Harty et al. compared PSM rates for patients with HRCaP who underwent ORP, LRP, and RRP, which were found to be similar across the three groups (52.9%, 41.4% and 50% respectively) (P = 0.13). PSM rate of 20% reported by Gupta et al. in their study of HRCaP can be due to less number of patients with multiple risk factors. Extended pelvic LN dissection (PLND) was performed in 80% (88) of the patients (early part of the series, PLND was not done), with 25% positivity rate. LN positivity was increasingly seen in multiple risk factor subgroups. LN density ≥ 15% was significantly associated with 2- and 5-year BCR. Gupta et al. and Beauval et al. report much lower LN positivity of around 10% in their series., Surgical series of cT3 disease have shown node-positive rate in between 27% and 41%. RP alone or as part of multimodality treatment has shown to produce good oncologic outcomes in large multicentric series.,, Apart from this, it provides accurate pathological information for planning adjuvant treatment., In a substantial number of patients, however, RP monotherapy will not result in a definitive cure; therefore, adjuvant or early salvage RT or ADT should be considered. In our study, secondary treatment in the form of adjuvant and salvage therapy was given to 37 (33.94%) patients. Adjuvant therapy (RT or ADT) was required in 9 (8.2%) patients while salvage treatment in the form of RT, ADT, or combination of both was given in 28 (25.68%) patients [Table 3]. Studies on RP in cT3CaP by Ward et al. showed that 78% of patients eventually needed adjuvant or salvage RT or hormonal therapy compared to 56% of patients in a study from Hsu et al., Gupta et al. and Beauval et al. reported use of adjuvant treatment in 35% of patients., Most patients (28 of 37) requiring multimodal therapy in our patient cohort were in 2HR and 3HR subgroup. The population identified by one risk factor only (1HR) had good BCRFS with surgery alone and without any additional treatment. This can be explained as all adverse pathological factors including PSM, LN positivity, pT3 stage, and Gleason sum > 7 were significantly more in 2HR and 3HR subgroup [Table 1]. On multivariate analysis of factors affecting BCR in our study [Table 4] and [Table 5], PSA was the only preoperative factor significantly affecting BCR. Other factors found significantly affecting BCR were pT, pN, and Gleason sum of the main specimen. Another interesting finding in our series was the downgrading of Gleason sum on specimen histopathology. Nearly 40% (13/32) patients with Gleason sum ≥8 on biopsy were downgraded to Gleason sum ≤7 on final histopathology. More significantly, of 12 patients who had HR disease on Gleason sum alone preoperatively, 6 (50%) were downgraded to lower Gleason grade in specimen histopathology. Gleason sum migration is a known phenomenon and has been described in multiple studies., This suggests that some patients stratified as HR initially are actually intermediate or low risk. Overall 80% of the patients were continent and 13% had stress incontinence requiring not more than one pad/day at 12-month follow-up. In addition, continence rate did not differ significantly across the three different surgical approaches used (77%–82% complete continence, P = 0.299). The overall continence rate among HR groups varies from 84% to 96% in various study groups. Our rate is comparable with these results. This highlights the fact that HRCaP alone and the type of surgical approach does not predispose to urinary incontinence post surgery. Major limitations of the present study are its retrospective nature, small sample size, and a short follow-up period. The study analyzed data over a period of 11 years during which there has been considerable change in technique and types of therapy; this can be a confounding factor in our analysis. However, since data on CaP in the Indian population is limited, this study does provides some insight into HRCaP in this region of the world. Localized HRCaP includes a heterogeneous population of patients with variable oncological outcomes. Primary RP in well-selected HRCaP provides durable cancer control and accurate pathologic staging along with good functional outcome. Substratification based on the three well-defined criteria leads to a better identification of the most aggressive cancers and prediction of need for additional treatment modalities. Thus, RP either alone (for single HR factor) or as part of a multimodal regimen should be considered a strong option for first-line management of selected men with HRCaP. We acknowledge the effort and contribution of the Dr Senthilvel Vasudevan, Department of Statistics, Amrita Institute, Kochi. Kulkarni JN, Singh DP, Bansal S, Makkar M, Valsangkar R, Siddaiah AT, et al. Retropubic radical prostatectomy: Clinicopathological observations and outcome analysis of 428 consecutive patients. Indian J Urol 2011;27:337-44. Dogra PN, Javali TD, Singh P, Kumar R, Seth A, Gupta NP, et al. 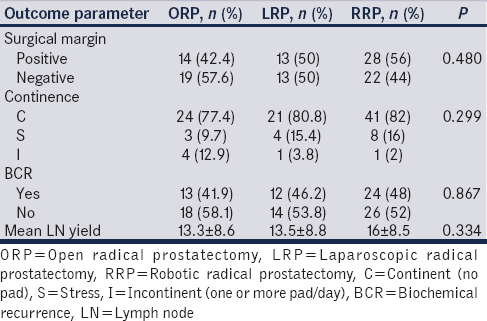 Perioperative outcome of initial 190 cases of robot-assisted laparoscopic radical prostatectomy – A single-center experience. Indian J Urol 2012;28:159-63. Garzotto M, Hung AY. Contemporary management of high-risk localized prostate cancer. Curr Urol Rep 2010;11:159-64. Cooperberg MR, Cowan J, Broering JM, Carroll PR. High-risk prostate cancer in the United States, 1990-2007. World J Urol 2008;26:211-8. Gupta NP, Murugesan A, Kumar A, Yadav R. Analysis of outcome following robotic assisted radical prostatectomy for patients with high risk prostate cancer as per D'amico classification. Indian J Urol 2016;32:115-9. Akaza H, Kim CS, Carroll P, Choi IY, Chung BH, Cooperberg MR, et al. Seventh joint meeting of K-J-CaP and CaPSURE: Extending the global initiative to improve prostate cancer management. Prostate Int 2014;2:50-69. Beauval JB, Roumiguié M, Filleron T, Benoit T, de la Taille A, Malavaud B, et al. Biochemical recurrence-free survival and pathological outcomes after radical prostatectomy for high-risk prostate cancer. BMC Urol 2016;16:26. Yuh BE, Ruel NH, Mejia R, Wilson CM, Wilson TG. Robotic extended pelvic lymphadenectomy for intermediate- and high-risk prostate cancer. Eur Urol 2012;61:1004-10. Van den Ouden D, Hop WC, Schröder FH. Progression in and survival of patients with locally advanced prostate cancer (T3) treated with radical prostatectomy as monotherapy. J Urol 1998;160:1392-7. Van Poppel H, Goethuys H, Callewaert P, Vanuytsel L, Van de Voorde W, Baert L, et al. Radical prostatectomy can provide a cure for well-selected clinical stage T3 prostate cancer. Eur Urol 2000;38:372-9. Carver BS, Bianco FJ Jr., Scardino PT, Eastham JA. Long-term outcome following radical prostatectomy in men with clinical stage T3 prostate cancer. J Urol 2006;176:564-8. Hsu CY, Joniau S, Oyen R, Roskams T, Van Poppel H. Outcome of surgery for clinical unilateral T3a prostate cancer: A single-institution experience. Eur Urol 2007;51:121-8. Yossepowitch O, Eggener SE, Bianco FJ Jr., Carver BS, Serio A, Scardino PT, et al. Radical prostatectomy for clinically localized, high risk prostate cancer: Critical analysis of risk assessment methods. J Urol 2007;178:493-9. Spahn M, Joniau S, Gontero P, Fieuws S, Marchioro G, Tombal B, et al. Outcome predictors of radical prostatectomy in patients with prostate-specific antigen greater than 20 ng/ml: A European multi-institutional study of 712 patients. Eur Urol 2010;58:1-7. Abdollah F, Sood A, Sammon JD, Hsu L, Beyer B, Moschini M, et al. Long-term cancer control outcomes in patients with clinically high-risk prostate cancer treated with robot-assisted radical prostatectomy: Results from a multi-institutional study of 1100 patients. Eur Urol 2015;68:497-505. Sood A, Jeong W, Dalela D, Klett DE, Abdollah F, Sammon JD, et al. Role of robot-assisted radical prostatectomy in the management of high-risk prostate cancer. Indian J Urol 2014;30:410-7. Harty NJ, Kozinn SI, Canes D, Sorcini A, Moinzadeh A. Comparison of positive surgical margin rates in high risk prostate cancer: Open versus minimally invasive radical prostatectomy. Int Braz J Urol 2013;39:639-46. 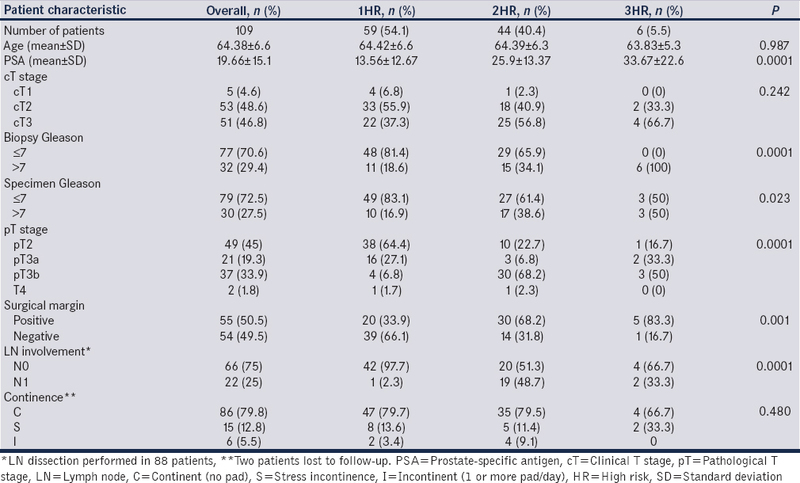 Ward JF, Slezak JM, Blute ML, Bergstralh EJ, Zincke H. Radical prostatectomy for clinically advanced (cT3) prostate cancer since the advent of prostate-specific antigen testing: 15-year outcome. BJU Int 2005;95:751-6. Messing EM, Manola J, Yao J, Kiernan M, Crawford D, Wilding G, et al. Immediate versus deferred androgen deprivation treatment in patients with node-positive prostate cancer after radical prostatectomy and pelvic lymphadenectomy. Lancet Oncol 2006;7:472-9. Keating NL, O'Malley AJ, Smith MR. Diabetes and cardiovascular disease during androgen deprivation therapy for prostate cancer. J Clin Oncol 2006;24:4448-56. Yossepowitch O, Eastham JA. Radical prostatectomy for high-risk prostate cancer. World J Urol 2008;26:219-24. Connolly SS, Cathcart PJ, Gilmore P, Kerger M, Crowe H, Peters JS, et al. Robotic radical prostatectomy as the initial step in multimodal therapy for men with high-risk localised prostate cancer: Initial experience of 160 men. BJU Int 2012;109:752-9. Ham WS, Park SY, Rha KH, Kim WT, Choi YD. Robotic radical prostatectomy for patients with locally advanced prostate cancer is feasible: Results of a single-institution study. J Laparoendosc Adv Surg Tech A 2009;19:329-32. Gandaglia G, Abdollah F, Hu J, Kim S, Briganti A, Sammon JD, et al. Is robot-assisted radical prostatectomy safe in men with high-risk prostate cancer? Assessment of perioperative outcomes, positive surgical margins, and use of additional cancer treatments. J Endourol 2014;28:784-91. De Carlo F, Celestino F, Verri C, Masedu F, Liberati E, Di Stasi SM, et al. Retropubic, laparoscopic, and robot-assisted radical prostatectomy: Surgical, oncological, and functional outcomes: A systematic review. Urol Int 2014;93:373-83.